< 50 Second Setup. Best $ Value. 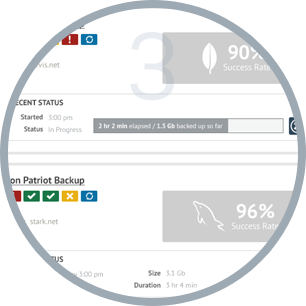 User friendly interface saves hours each week in setting up backups. No need to write backup scripts & Cron jobs. 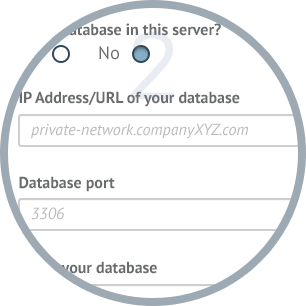 Cloud-based service that connects with databases & servers via SSH or client-side agents. Users schedule backups on their preferred days and times. Cloud based system automatically performs backups on schedule. System sends alerts to the user regarding the status of their backups. All backups are retained forever in storage. User can recover and restore their files & databases from the cloud with ease. Point & click interface delivers quick access to their backups. Flexibility to grow or shrink based on your storage needs. All backups are stored on Amazon S3. All backup data is transmitted over a secure communications layer using SSH. Data is further protected at the storage layer in the Cloud. Connect & backup data from databases & files residing in private (behind a firewall) or public clouds. 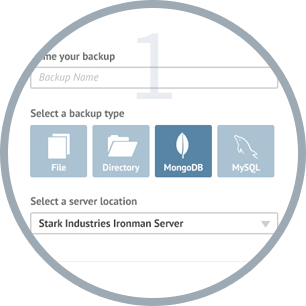 Backup heterogeneous DBs that include MySQL & MongoDB. Additional Systems & File support for Linux, & Unix. "I like BitCan because my backups just happen. I don't have to think about them, which is exactly how it ought to be!" "A backup service should be silent and reliable and have minimal impact. BitCan is all of that, and we couldn't be happier!" "BitCan's intuitive user interface and heterogeneous database support reduces database backup configuration and setup time from hours to minutes." Common database, development language, and framework types we cover. Have a special request? Contact us. All data backups are retained forever in storage as long as the user maintains an active billing account. There are no time limits on data retention.